"Alternative business models such as worker-owned cooperatives are gaining ground, proving that a more just and sustainable future is possible." Six years ago, the global economy nearly collapsed. Now big corporations and the wealthy are recovering well. But that’s not the case for the vast majority of Americans: according to calculations by author Les Leopold, the richest seven percent gained $5.6 trillion net assets from 2009 to 2011, while the remaining 93 percent lost a combined total of $669 billion. Americans are not content with this state of affairs. According to a recent report by the Pew Research Center, 62 percent believe the dominant economic system favors the powerful, while 78 percent believe too much power is concentrated in the hands of a few large companies. This enormous economic divide is just one reason people are losing patience with the corporate economy–and why many are turning to initiatives that build a new economy. Grassroots groups, local entrepreneurs and broad-based coalitions are building the foundations of an economy that distributes economic benefits widely and minimizes damage to the environment. Local food, once a tiny niche market, has gone mainstream. The growing, processing and marketing of local foods is booming–not just on the crunchy West Coast, but also in Appalachia in the eastern U.S., in abandoned neighborhoods in Detroit, Michigan and towns and cities throughout the country. Through farmers markets and direct purchases from growers, the food travels quickly from farm to table, keeping it fresh and nutritious. Avoiding red meat and dairy may be a more important way to avoid contributing to the climate crisis than eating local, and local food isn’t always greener. Still, a local diet does reduce emissions from food transportation, support local jobs and connect people to their neighbors and local environment. Worker-owned co-ops have been spreading, particularly since the recession. While they, like all businesses, can struggle, they can also help keep good jobs stable and keep money in the community. In the Bronx in New York City, the 2,300 employees who work at Cooperative Home Health Care Associates get better pay, more job security and more training for career advancement than their counterparts at competing firms. More than 1,000 of them are owners in the company, and 90 percent are women of color. 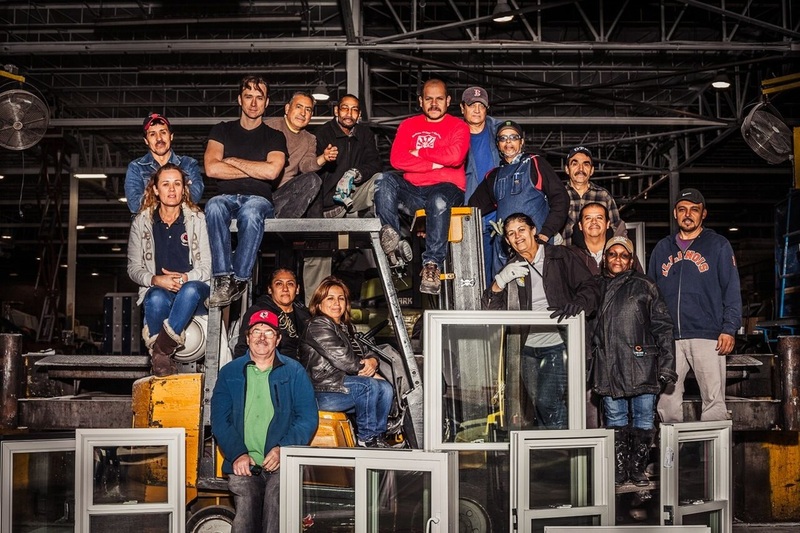 In Chicago, workers at a manufacturing plant who were laid off when the plant was shut down bought out the factory and now operate it as New Era Window and Doors. The most famous example of worker ownership, however, is the Mondragon Cooperatives in the Basque region of Spain (see our Summer 14 Edition), which has more than 70,000 worker-owners in more than 200 enterprises. Labor unions and community activists in the US are beginning to emulate Mondragon’s success, especially in hard-hit Rust Belt regions. Maker, DIY and sharing culture is blossoming. Young people especially are repurposing old clothes into fashionable art, making art bicycles, building tiny houses and writing open source software. While some peer-to-peer platforms, such as Uber and Airbnb, have raised controversy, some people are truly sharing–not for money. Online platforms like Couchsurfing let people share their homes with travelers. Others have started “payit-forward” restaurants where you pay not for your own meal, but for the person behind you in the line. An ethic of reuse and no waste, a bias for local and small-scale, and a preference for generosity make this a particularly creative space in the emerging new economy. Shortly after the recession, millions of people shifted their accounts from too-bigto- fail banks to community banks and credit unions. Now some are going further. Campaigners in 22 states aim to open government-owned banks at the state, county or municipal level to finance local economies and keep profits nearby. The latest trend, in light of the threat of climate disruption, is to divest from holdings in coal, oil and gas companies. To date, more than 800 global investors have pledged to divest over $50 billion. Redirecting assets from big corporations and Wall Street to sustainable local enterprises is providing investment capital needed to fuel the new economy. Some of our society’s most precious resources belong to all of us. These common assets include fresh water, the Internet, green spaces in our cities and the storehouse of knowledge we inherit from previous generations. The new economy draws on the wealth of these and other common resources, but does so in a way that neither depletes them nor excludes others. That means protecting water quality, keeping the Internet open, protecting the stability of the climate, and ensuring access to a good education– for ourselves and for those not yet born. The new economy emerging from these initiatives is not a new ideology or a utopian mirage. It’s built on grassroots-led, pragmatic actions that people around the U.S. and around the world are taking to create widely shared, sustainable prosperity.